Despite announcing a lower refugee-resettlement ceiling for the coming fiscal year, the Trump administration continues to support the UN's Global Compact on Refugees, which is in total contradiction to the administration's refugee policies. The Trump administration, on the other hand, announced the FY 2019 refugee ceiling of 30,000, down from 45,000 for 2018 (both ceilings count as the lowest ceiling determinations since the creation of the refugee resettlement program following the Refugee Act of 1980). The reasoning behind such low ceilings is two-fold: Improving the screening and vetting of resettlement candidates (which means slower admissions) and reducing the untenable asylum backlog by reassigning refugee officers to asylum cases. The Trump administration's continued commitment to the UN agreement is puzzling. There's another concern: The compact is set to devise a three-year strategy (2019 -2021) to increase the pool of resettlement places. Furthermore, as stated in the latest text (p. 6), in order to "ensure sustained momentum and political will", periodic Global Refugee Forums will be convened for all United Nations member states "to announce concrete pledges and contributions towards the objectives of the global compact" and to consider ways to enhance responsibility-sharing. The first Forum will be convened in 2019; subsequent ones every four years. The compact could outlive the Trump administration as early as January 2021. The United States is still part of the Global Compact on Refugees despite withdrawing last year from a distinct but related compact, the Global Compact for Safe, Orderly and Regular Migration. Both agreements were set in motion following the unanimous adoption of the New York Declaration for Refugees and Migrants by UN member states (including the United States under the Obama administration) in September 2016. Many versions of the refugee compact have been released during the past months. The latest version or "Advance Version," out on July 20, is the one being presented for adoption by the UN General Assembly in a few days. A previous version, confusingly called the "Final Draft," was released at the end of June following 18 months of formal consultations. UNHCR's Protection head, Volker Türk, insisted on the need for a new international agreement on refugees other than the 1951 Refugee Convention. According to him, the 1951 convention, while focusing on rights of refugees and obligations of states, does not deal with international cooperation; it "does not specify how you share the burden and responsibility, and that's what the global compact does. It responds to one of the major gaps we have faced for decades." Türk added: "Also, we would aim [through the Global Compact on Refugees] to get more resettlement places and find more ways refugees can move to third countries – such as through family reunification, student scholarships, or humanitarian visas, so that refugees can travel safely (what we call 'complementary pathways')." According to Türk, the refugee compact's adoption by the UN General Assembly at the end of this month will be a demonstration of "a very strong political commitment of all 193 Member States to implement it, even if it's not legally binding." I highlighted the refugee compact's major points following the release of the second draft, and these points remain the same in the final text to be adopted in in a few days. The refugee compact describes its goals as "to: (i) ease pressures on host countries; (ii) enhance refugee self-reliance; (iii) expand access to third country solutions [including resettlement]; and (iv) support conditions in countries of origin for return in safety and dignity. "the use of emergency transit facilities or other arrangements for emergency processing for resettlement." (p. 22) Footnote 47 says: "Issuance of single voyage convention travel documents for the purposes of facilitating evacuation may be required. This could be facilitated by UNHCR on an exceptional basis." "complementary pathways for admission, with a view to increasing significantly their availability and predictability." "Contributions will be sought from States, with the support of relevant stakeholders, to facilitate effective procedures and clear referral pathways for family reunification, or to establish private or community sponsorship programmes that are additional to regular resettlement." "Other contributions in terms of complementary pathways could include humanitarian visas, humanitarian corridors and other humanitarian admission programmes; educational opportunities for refugees (including women and girls) through grant of scholarships and student visas, including through partnerships between governments and academic institutions; and labour mobility opportunities for refugees, including through the identification of refugees with skills that are needed in third countries." (p. 22). The main addition to the latest version of the text followed criticism from non-governmental organizations such as the International Rescue Committee (IRC), Amnesty International, and some member states. Since the compact is not legally binding, these groups insisted on the need for accountability measures that were absent from the previous "Final Draft" version. A plan, therefore, to develop indicators to measure progress and accountability of the compact's four objectives was added to the latest version (see here , p. 24). Farida Bena, director of humanitarian policy and advocacy at the International Rescue Committee (IRC), said of the latest version of the text: "This draft reintroduces stronger language on accountability, an incremental approach to responsibility sharing, and clearer ways forward on resettlement." Bena added: "The latest version includes a paragraph — at the request of many member states and IRC — that reinstates a plan that indicators will be developed for each objective ahead of the first Global Refugee Forum". Bena also said that the "follow-up work should start soon." In fact, the first Global Refugee Forum is expected in 2019. 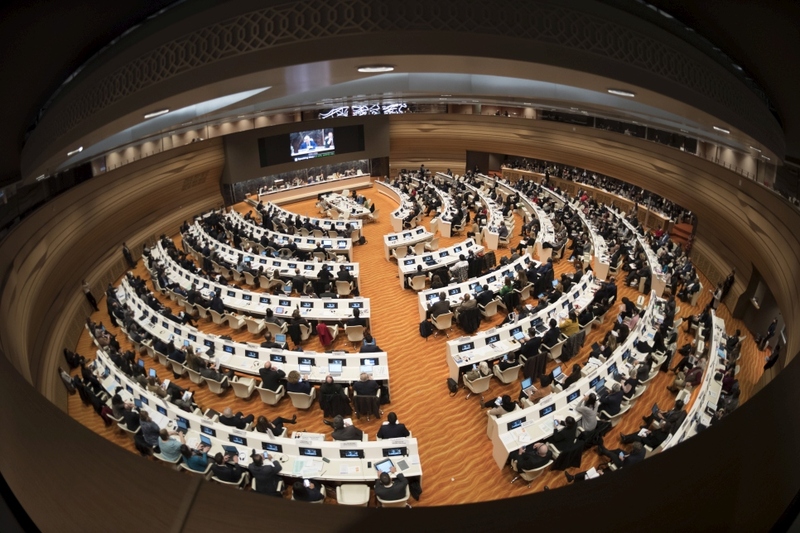 Forums to be held every four years will assess the progress made towards the achievement of the objectives of the compact; while high level officials' meetings to be held every two years (the first in 2021) between Forums will provide an opportunity for "mid-term reviews". As mentioned earlier, the Trump administration might no longer be in power to follow-up with mid-term reviews or other developments. By agreeing to officially sign this agreement in a few days, President Trump would be setting the grounds for the United States (and its future administrations) to partly abide by UN rulings on refugee assistance, whether abroad or on American soil. This would also mean relying on organizations like the IRC to carry on with the compact's tasks. Let us look at these tasks again: Redefining resettlement beyond urgent refugee protection; increasing resettlement admissions, pushing for faster and more flexible resettlement processing modalities; facilitating access to family reunification and including extended family members who would not otherwise be eligible under existing mechanisms; and encouraging other pathways for admission as "complement to resettlement". None of this is consistent with the administration's priorities. President Trump is carrying on with a process started by his predecessor, one that appears to be in total contradiction with his administration's refugee policy. Confusing move? You bet.